I was enjoying a beer over the holidays with a friend and sharing our recollections of the past year and what we had to look forward to in the coming year. Dan had his best year ever, he hit his sales numbers about two-thirds of the way through the year, earned a huge bonus and enjoyed promotion to a senior account manager role. His boss was expecting to see him take a higher profile role in the team with added responsibility, he was going to be traveling more, and his new sales target appeared atmospheric. He didn't know how he was going to fit it all in. He was dreading 2017. If the end of 2016 for you was anything like it is for Dan, you found yourself having to try and wrap up some key projects, drive in some final numbers, perhaps even complete performance reviews and other year-end tasks. Then, before you can catch your breath or even start to worry about work, you were straight into planning, preparing and, hopefully, enjoying the holidays with family and friends and not getting despondent from all the negativity that many people felt this past year, in particular, brought them. You must be exhausted already! Kicking off another year can be a daunting proposition. A new year brings a fresh set of challenges and almost a feeling of starting all over again. It doesn't have to be that way. First things first, bid a final farewell to the last year, you can even use the 15 questions from the Review Your Year With No Fear Workbook to feel entirely complete, get your copy by clicking here. Now for 2017. How do you find the energy to kick off another year, build your personal brand, maintain momentum and ensure you don't get bogged down or distracted to still achieve what you want to in your career? Here are seven ways to boost your personal brand and get things done without feeling overwhelmed. Goal setting is important, and although I am not in the camp of saying that goals or resolutions don't work, we need to be smarter and realistic about what we set and expect of ourselves. Only 8% of goals or resolutions set are achieved by year end, so rather than run the high likelihood of not hitting them, or even dropping them before the end of January, set yourself one big career goal for the year. Imagine that you are sitting down having that beer with Dan at the end of this year and excitedly telling him what that one significant career achievement was. Then work backward, identifying the steps, actions and milestones it took to get there. Once your know what you year goal is ensure that you stay focused. Review it each evening and then commit to one action the next day that is going to move things forward. Determine what your most productive time of the day is and book an appointment with yourself to spend at least 30 minutes on that one thing. Resist the temptation to open emails, or worse distraction of social media, do not let others peoples lives and agendas run your day. If I were to ask some of your colleagues what you are known for, what would they say? Is that what you want recognition for this year? We have all heard the figure of speech "Jack of all trades but master of none." Don't be thought of like that at work. Identify the essential skill or attribute that you want to own this year, then do a self-communication audit to determine the best medium for you to communicate your uniqueness and get noticed at work consistently. Managing how your online brand is perceived is important, trying to do it across a multitude of channels is foolish unless you have a team to do it for you. For many of you, there will be one social network above others that makes the most sense for you and your target audience. Most professionals will find that will be one of the 'big' three or four - Facebook, LinkedIn, Twitter or Instagram. Pick one and become highly efficient and impactful. Do not run the risk of diluting your personal brand by trying to cover all the bases; it will likely end up feeling like too much work and like a resolution fades away or be a drain on your time for little return. The end or the start of a year is an excellent opportunity to review your network strategy. If you ask "What strategy?" then start by determining what you want to offer and get from investing time in other people. Do not look to be adding connections for the sake of saying you have a big network. Think instead about who you can help, who you can influence, who influences you and who can help you move toward that career goal. Then look to add value purposefully, help others and career karma will come back to you over time. Stay consistent with your networking activity, do not only look to 'fire up the Rolodex' when you need it. One of the reasons that most of you will drop off the resolution wagon is a failure to review and measure your progress. Start this year by benchmarking the essential elements that will determine your career goal success. Like Dan, this might be revenue figures; it could as easily be the number of connections or followers or readers of articles. Whatever the metric is that you choose, be sure to review progress at least monthly. That way if things are not tracking the way you hoped you could make adjustments or change tactics. If 2016 taught us one thing, it was to expect the unexpected. Not everything is going to happen the way you want it or in the timeframe you expect. Don't push the agenda too much that it compromises your personal brand. Stay true to who you are and what you believe and stand for rather than appearing false or inauthentic. Be prepared to pivot when necessary, however, resist the temptation of the next bright shiny project before you have given it a fair shot. Depending on the culture, faith or belief the significance of the number 17 has a variety of interpretations, check them out here. I liked the fact that you need 17 muscles to make a smile, good enough reason for me to make you smile this year. 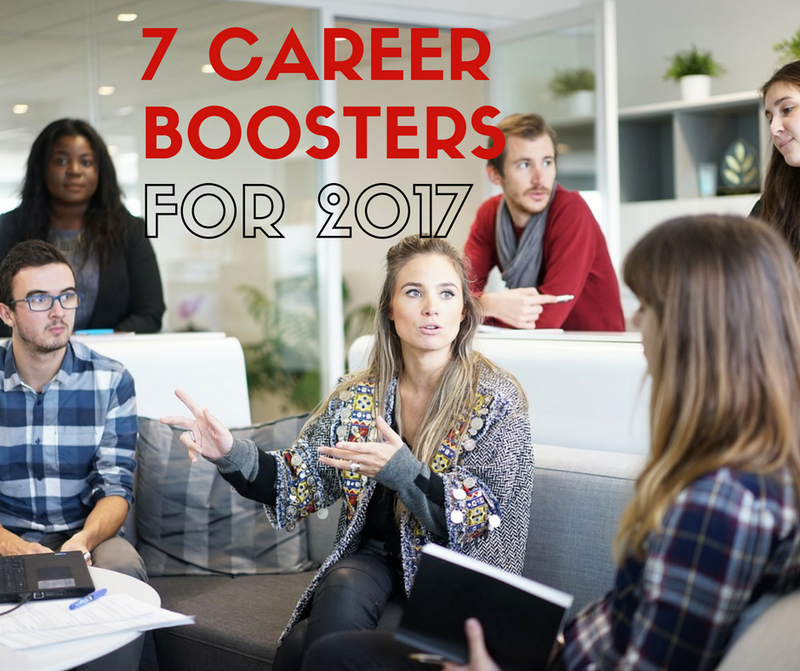 Looking for more help in taking your career to the next level in 2017? We will be launching our Getting Your Year in Gear program later this week, sign up to be notified first by clicking here.